Although Open Area 5 seems to be characteristic of a ditched trackway rather than an enclosure, features of late 1st century BC/early 1st century AD (Period 2A) date occur within its 'interior'. However, these do not necessarily compromise its function as a routeway and some may in fact complement it. These occupying features are described from west to east across OA5. Solitary pit 9649 is located at the west end of the investigated extent of OA5. With a diameter of c. 0.5m and 0.06m depth, its fill contained only a small amount of grog-tempered pottery. About 65m further east of pit 9649, alongside and including southern OA5 boundary ditches 25251, 25121/25250 and 25224, is a stratified sequence of features that all pre-date the imposition of Road 1 (Figures 22 and 26). The earliest in the sequence, Waterhole 6734 (Group 67), is a roughly round pit some 2.3m in diameter. Its rather irregular, concave, sides narrow toward the bottom to form a central, circular 'shaft' cut into natural brickearth to a depth of 0.83m. It contains a relatively complex sequence of nine banded sand, clay and charcoal-rich fills, the lower of which appears to be water-lain. These contain only small amounts of pottery, bone and baked clay, together with an iron blade (SF8314). 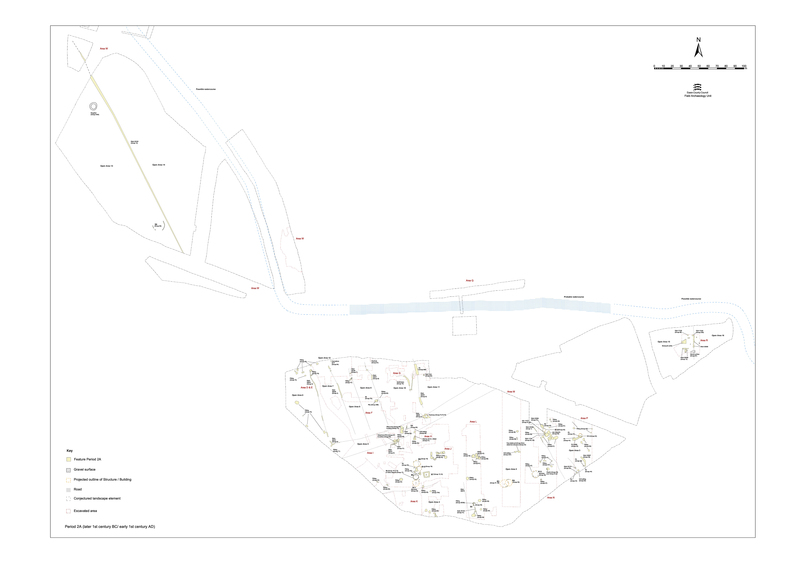 Around the northern part of the waterhole is a localised area of surfacing 6793 (Group 68), formed by a spread of rounded flint pebbles, pot sherds and animal bone compacted into the natural brickearth. Surviving as a 1.50m-wide swathe, it may have originally extended completely around the waterhole; an area of undulating brickearth to the south-west may denote subsequent ground reduction that would have truncated the surface in this area. The extant surfacing is cut by pit 6714 (Group 69) which is located immediately east of the waterhole. This sub-rectangular cut contains a gravel backfill over a small deposit of charcoal-rich silt, both of which contain few finds. This pit also cuts ditch 25250 (Group 21) suggesting that some elements of the OA5 boundary become redundant. 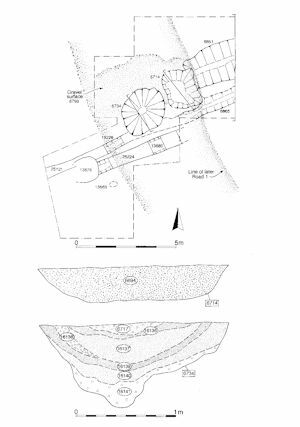 The pottery within Waterhole 1 and pit 6714 may be deposited as early as the late 1st century BC (as suggested by the amphora from 6734) and handmade jar from 6714). 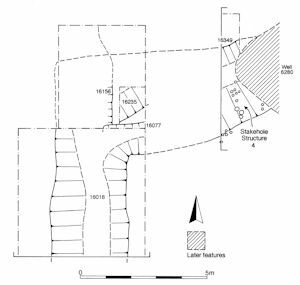 Wide linear ditch 25252 (segs 6385, 16018, 16044, 16349) perhaps represents the corner of a substantial ditch (Figure 8 and Figure 28). Its north-south aligned portion is 3m wide and 0.6m deep, while its eastward return has suffered less horizontal truncation and survives to a depth of 1.1m. 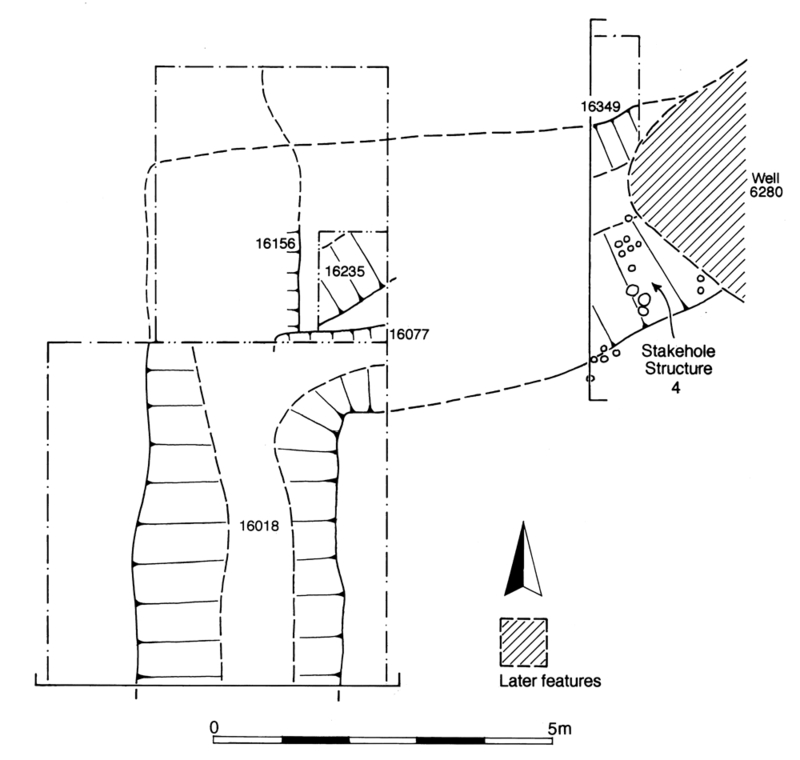 Traced only for a short distance (where overlying Roman stratigraphy was removed), the eastward continuation is less regular and perhaps begins to curve towards a more ENE-WSW alignment to the point at which it is truncated by Roman well 6280 (Period 3). Although the ditch is apparent in the opposite side of the well cut, its continuation is not traced beyond this. 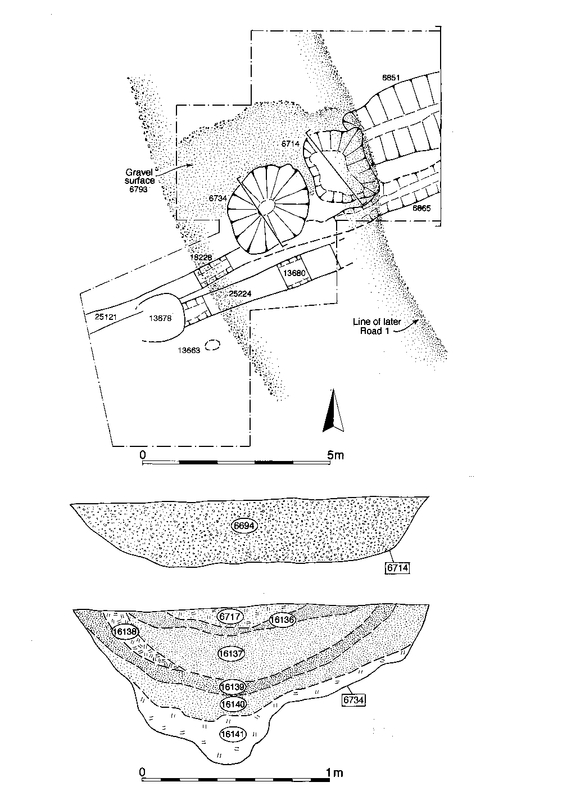 The ditch fills contain a large pottery assemblage (KPG2, seg. 16018), which includes handmade jar forms and Dressel 1 amphora. Sherds of intrusive Roman material - understandable given the intensive later activity in this part of the site - are also present. The artefact assemblage is typically late Iron Age, with modest amounts of bone, baked clay and occasional loomweight fragments present, but also a potin coin (SF 5645) of the mid-1st century BC. 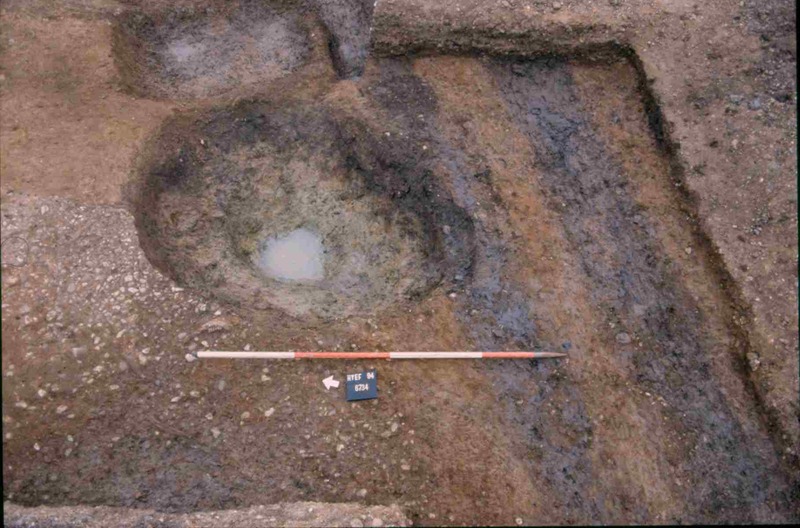 The intrinsic dating evidence suggests that the ditch is filled in by the end of the 1st century BC; it is certainly out of use by the onset of Period 2B, when it is sealed by the levelling and resurfacing of Open Area 19. The ditch may be partially re-cut (Group 64) and a concentration of 17 small stake-holes (Group 65) inserted into its top fill. These may have been part of a fence (Structure 4) associated with the later life of the ditch. The sparse artefact assemblage is likely to date from the second half of the 1st century BC and a single sherd of black-surfaced ware (from 6999) may be intrusive, though is not necessarily out of place here. 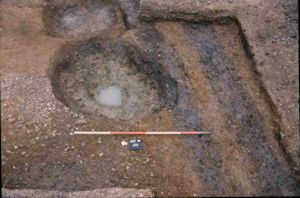 Two small pits 6964 and 16207 (Group 70), also cutting infilled ditch 25252, contain only small quantities of pottery spanning the late 1st century BC to early 1st century AD, and animal bone. Pit 6964 also contains a copper-alloy cosmetic tool (SF7360). 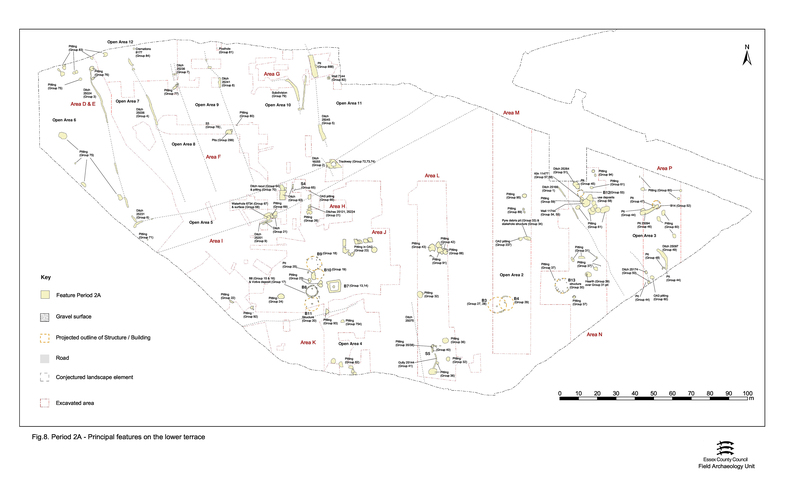 A final area of activity within Open Area 5 is located further east (Excavation Area H). It is represented by a series of silty or clayey deposits (Group 72), most of which appear to be deliberate levelling material or else reworked subsoil. 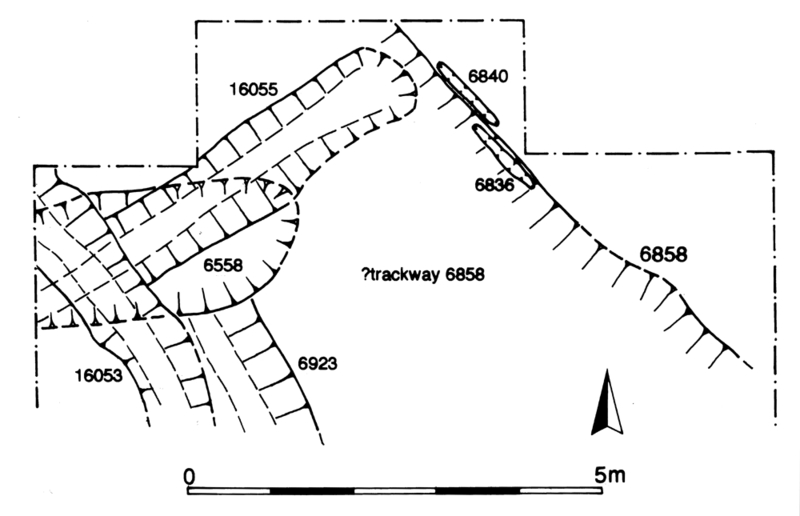 These form a make-up for NNW-SSE aligned Trackway 6858 (Group 73), a broad, shallow linear feature, 2m wide and a maximum of 0.2m deep - probably more of a wear hollow rather than a deliberate cut (Figure 8 and Figure 29). It is traced for a distance of 6m and is presumed to continue further north and south, though this was not demonstrated by excavation. Within the hollow a possible surface was cut by apparent wheel ruts (Group 74). 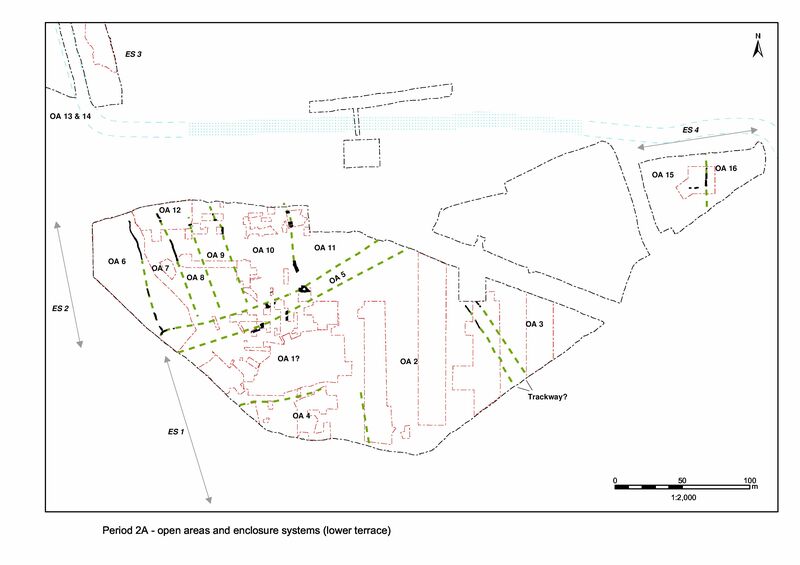 Group 2007 represents less well stratified and largely unplanned activity/deposits, possibly relating to the disuse of the trackway. The trackway overlies and disregards ditches 16053 and 16055; however, it does appear to reflect the earlier alignment of 16053. The trackway could represent a modification to the enclosure system, with the insertion of an access point between OA5 and OAs10/11. Alternatively, the remains could be the southern end of the OA10/11 boundary itself. 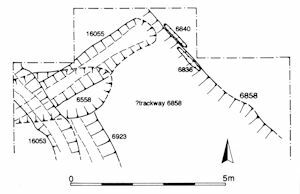 Either way, it is certainly the case that Trackway 1 cannot be part of the later, Period 2B, organisation of this part of the site as it is sealed by OA19 gravel surfaces. Shallow scoop 6928 is only 0.1m deep and only partially investigated, but is likely to be a pit cut into the natural gravels. Similar features are present to the south (6932, 16348) that were probably dug for gravel extraction. It is unclear if 6928 is a northern outlier of this activity or a distinctly separate pit.